"Neonatology at a Glance" provides a concise and accessible introduction to neonatal medicine for junior doctors, medical students, neonatal nurses and midwives. Following the familiar, easy-to-use at a Glance format, each topic is presented as a double-page spread with key facts accompanied by clear diagrams and illustrations encapsulating all that the students need to know. This brand new text is written by the leading experts in the field. 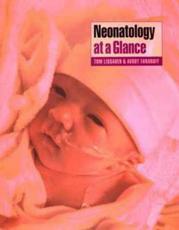 Full-colour comprehensive overview of neonatology including, the preterm infant, common neonatal conditions and their management, critical care for babies, special baby units, palliative care and ethical issues, and practical procedures is organised according to conditions affecting the infant before birth including foetal medicine, the normal newborn infant, followed by neonatal problems. It includes practical procedures in text and diagram form not usually found in neonatal books. "Neonatology at a Glance" will appeal to all junior doctors and clinical medical students undertaking their paediatric attachment and revising for final exams. The book is also suitable for nurses training in child health, nurses in special care baby units, therapists and midwives.